to buy a fat pig- no some pottery! I hope. I'm praying, meditating, doing anti-rain dances and tying my shoelaces in special knots - anything so long as it doesn't rain on Saturday during the market! I'm bringing lots of ferny pieces- bowls and cups and mugs and platters- some speckled ware- and a new selection of butter crocks and honey pots. I'm really excited about these two butter crocks- I have more like these in the works. And is it vain of me to tell you that this honey pot makes me squee just a little? I was really tickled with these- I can see a set of canisters in this design in my immediate future! I'll definitely be making more of these- in all sizes. There are lots of pieces that I made that are staying at home- they were bisqued, but because of my focus on the platters, I didn't get all of the glazing I'd planned to do done. 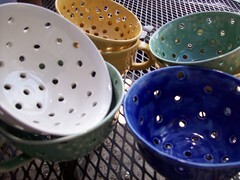 In fact, I didn't run my kiln at all this week- but there are several new things coming to the market with me.
. . . Including some of these HOPE pieces! I have a handful that I've made recently to bring to the market. 60% of the price of these pieces goes to support the recovery efforts of the West TN Haiti Partnership, which specifically serves St. Vincent's Hospital, Orphanage, and School in Port-au-Prince Haiti. You can check my shop for more information, pieces, and sizes. My selection on Saturday will be limited, but they will be there! I do appreciate your help in raising money for the desperately poor and handicapped in Haiti. So. I hope that the rain comes tonight and stays away Saturday day. And I hope your weekend is beautiful. Have a good one! How are you? You know how sometimes it feels like your weeks fly by? And sometimes it feels like three days have already been a week? I think when I have a concrete deadline things start to go haywire. On Monday I bought a tent for the market. I hope hope (fingers crossed) that it will arrive before Friday. I started running again and got in a little easy 25 minute jog with my dog. Monday was also a glazing day- and the bottom broke out of one of my buckets of glaze. Happily, I was glazing over the kitchen sink so most of the mess was contained. Also happily, it was the sepia color I use on my herb markers and almost nothing else. And I have more dry glaze. I tried to salvage what I could (many glazes settle into a thick sludge at the bottom of their buckets) by mixing the sludge with a little bit of clear glaze- and the markers came out clear. I'll redo them in a bit. It took most of the day, but I got my glazing finished. Hundreds of herb markers and the first round (they have to be glazed twice to encase the speckles in glaze) of all of my speckled egg ware. Right before the glaze bucked busted, I remembered that I had a dentist appointment and went to it, covered in glaze, still wearing running clothes. I couldn't stop laughing- I was mortified that I forgot, that I was filthy, but there you go. Tuesday we had QUITE AN ADVENTURE that took up the entire morning. This adventure was right on top of the work that I needed to do and, ah, effectively prevented me from doing it. Then we had a funeral to attend. By the time the funeral was over school was out, little boy had a dentist appointment. After the dentist appointment, I managed to get the rest of my pots waxed and some details glazed. And I began to see the humor in life before deadlines. This morning everything has gone smoothly. I ran, unloaded the kiln, put the second glaze coat on my speckled pieces, finished glazing the rest, loaded the kiln, and now just need to reglaze those clear-sepia herb markers, start firing, clean up my glazing mess, then finally shoot pictures of my HOPE pieces and new egg vases to put up in the shop. I certainly expect something of a crazed/epic nature to happen, as it does when deadlines press. But I think that I'll laugh instead of flip out. So far it's been pretty funny. If you're in Memphis, I do hope you'll come down for the opening day of the market. It should be a beautiful day and a lot of fun. Have a lovely rest of your week! These are new. I more than kindof love them. 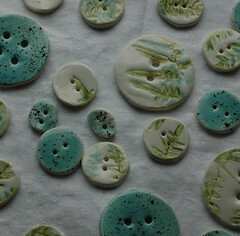 Michelle, a local knitter and pottery customer, had asked me about making leaf-imprint buttons this summer. At the time, I couldn't see how I'd do them, but when I started using ferny scraps to make very small trays, I knew how to do it. I hope y'all like them as much as I do. I've had a great but crazy-busy several days. Friday I was at St. Jude Children's Research Hospital for their holiday market. They're using the vendor fees from monthly-to-quarterly farmers and craft market to raise money to build an interactive vegetable and flower garden for the patients. I was thrilled to be there and support such a wonderful project. Several of my Memphis Farmers Market friends were there, and I met some other vendors who were just wonderful. More about them soon. Yesterday was the MFM Holiday Market. Despite the crazy traffic issues from the marathon (but we're all grateful for and proud of the runners who help raise so much money for research and the kids at St. Jude) and the chilly weather (normal high is 55, yesterday's high was 42, windchill hovered around 32 all day), the market was very well attended. Today I'm throwing a little more, packing and shipping etsy orders, and preparing to make a final (I think. I may update after the 16th if there are good leftovers after my next show) holiday listing over there. I'm also making up a batch of gingerbread cookie dough and experimenting with some lemon-thyme shortbread for my own holiday giving. I usually make rosemary-pecan shortbread- that may be hard to top. Hope your sunday is restful! If you're a Memphis or mid-south reader, I hope I'll see you there! During market season I do 70% of my grocery shopping at the market, the only things I buy at the grocery store are milk and flour- the market has it all- produce, flowers, fruit, eggs, beautiful hormone-free meats and cheeses, granola, honey, bread and desserts, pecans, and craft goods made from talented regional artisans. I'm so excited to be a part of MFM for fourth year! See you there- opening day is April 18, 7am-1pm!